I hope you are enjoying a wonderful week! It's so hard to believe that August is more than half over already! We've had a pretty cool month for NC, and I wonder if that means the winter might be colder than normal as well? We shall see... sooner than I'd like I'm afraid! Anyway... today I'm just popping in with a few cards I made for the DTGD challenges on SCS last week. My goodness that was quite a week! I can't believe how many girls actually made all 49 challenges individually, meaning they made 49 cards during that week. I managed to get all the challenges, but only by combining several in to one card. So above is one that I made, using ODBD You Will Find Refuge. This is an older set but will always be one of my favorites. I have a "thing" about Chickadees... I just love them! I also love this Scripture. It has been such a comfort to me during some of life's darkest hours. The paper is BasicGrey and is called Serenade. It is on a kraft base. The branch is Memory Box, and the greenery is an MS punch. Then I thought I'd share one that was just plain fun! The challenge was to make a triangular card. 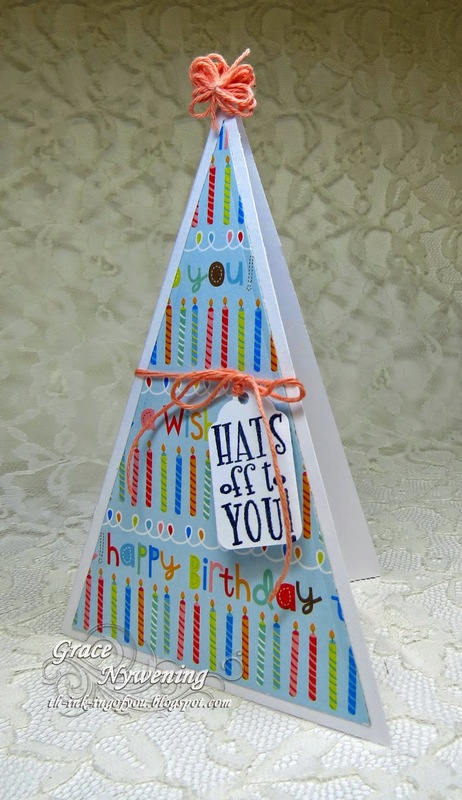 I thought about a Christmas tree, but then the idea came to me to make a birthday hat. I used fun design paper from MME, and used my Spellbinders triangle die to cut this in such a way that the side fold was just outside of the cut line. I made the little pom at the top with twine, added a punched tag with a sentiment from My Sentiments Exactly, and it was done. THIS has to be the quickest card I've ever made! LOL! Then, I made this one, using an Inkadinkado image which I hand cut and then matted with a layer of black, cut with a Spellbinders Majestic Labels 25. One of the challenges for this card, was to use metal on your card, not just tie on a charm, but somehow actually use metal, so I made this frame for my sentiment, which is from Sweet 'N Sassy. 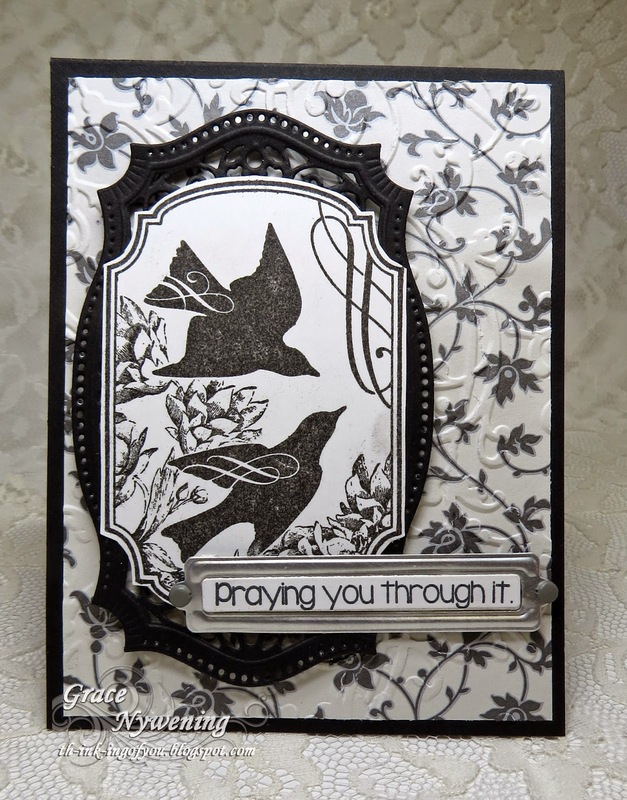 I cut open a lemonade can and used it to run through my Grand Calibur with this Spellbinders Back to Basics Tag. So that's a few for today. I hope you enjoyed seeing something a little different from me. 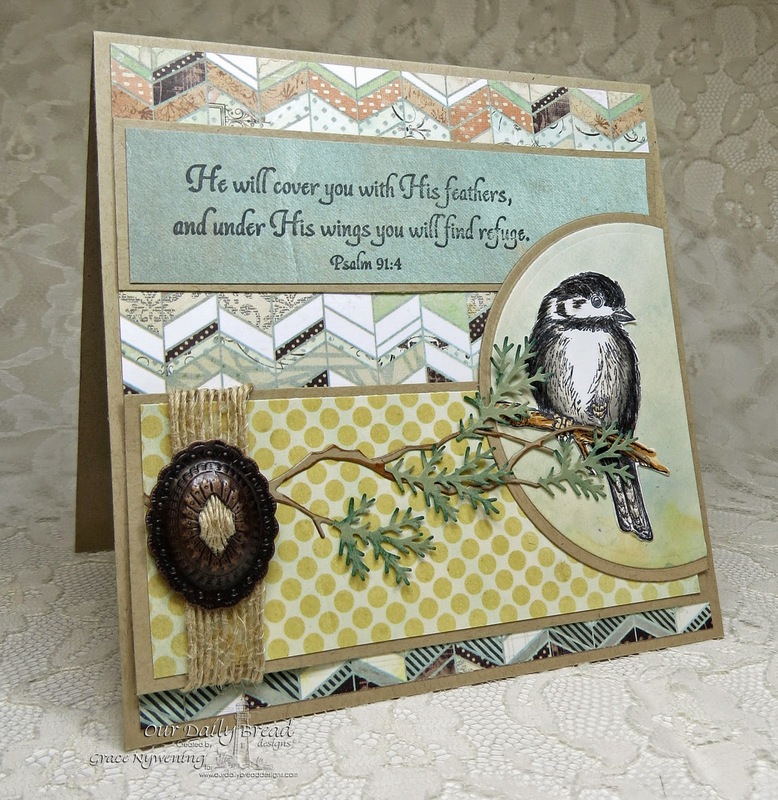 Reflecting on the concept of our Lord covering us with His feathers, and the refuge He is to us when we are safely sheltered under His wings, I just found myself singing that old hymn, Under His Wings. That led me to search for the lyrics, which led me to several newer versions of the old song, but none touched my heart like the old hymn. For those of you who love it as much as I do, and for those of you who perhaps are struggling with something in your life right now and need to find safety and refuge... here is a link to a beautiful rendition you can listen to... just a a little over 3 minutes, and you will be blessed! Grace, all of these are fabulous as always but the Under His Wings is my favorite....I love the way you have used the image with the branch and the greenery - I just may "steal" that idea sometime because this set is also one of my favorites along with The Mighty Sea. You are always so inspiring. Have more. I love that first card. Grace these are beautiful cards - I do love seeing your talent expressed in other techniques. I love the bird, it's so cute, and the hat was a great idea, I never would have though of that! Thanks also for reminding us that we are always under His wings! Just love the way you brought in the diecut branch with the stamp on the first card! I can not believe that Aug is almost over either. My grandmother used to tell me "the older you get the faster the time flies".. She was right :). Your cards are gorgeous Grace. Mercy me. How did this post slip by me. Your creations are always an inspiration. To have three on the same post all, of which are excellent, is a shame on me moment. Even the sentiments are exactly what should be with each card. The second card is a departure for you but I can tell you had fun making it. Bravo. Grace. Gravo. Side Step Card and Sneak Peek! A Shaker from the Shore! Ocean's Treasures for us to adore! A Legend, A pocket and a bookmark!